Life is a flirt. Love is a game. The sky is your limit. Beyoncé Pulse Summer Edition gives you a burst of the inexplicable energy you feel during the Summer. It will leave you feeling great, ready to conquer anything, as if nothing and no one could ever resist you. The notes feature mandarin, pear, pink pepper, ginger orchid, jasmine, orange blossom, sapphire woods, musk and benzoin. Beyoncé Pulse Summer Edition will be available in 50 and 100 ml Eau de Parfum. Can’t freakin’ wait! I hope it’s here before Feb! It’s already on the website so maybe it’s being shipped to stores now! Can’t bring myself to go near anything Beyonce at the moment, which is too bad because I do like my bottle of Heat Rush. If I could just find a sapphire wood tree and harvest the sapphires, I might be able to afford all the scents I do want to buy. Sapphire wood is about as real as her pregnancy. Something old, something new…seriously, they just needed something blue. It’s not a favorite of mine either. Ya, don’t dig on the bottle thingy..maybe if I was on the Enterprise..in a galaxy, far, far away. 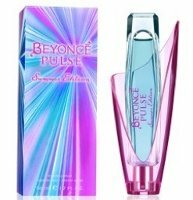 I really haven’t liked and sometimes really disliked Beyonce’s scents..I would have to sniff Pulse again..but the Heat ones were awful(IMO):). Somehow I doubt this would leave me feeling great and ready to conquer anything. Never been a Beyonce fan. I did have a tiny bottle of Heat because it was marked down 75% after Christmas last year. Hated it and tossed it out. Haven’t smelled Pulse and have no desire to. I thought original Pulse smelled sweet and summery, if this is any sweeter it will cause tooth rot ! I mean I love sweet perfumes but Pulse is nearing the line on too sweet.